1. Select the XM® mode. 2. Press to switch to the Audio menu screen. 3. Rotate to select XM Tune Mode, then press . 4. Rotate to select Channel Mode or Category Mode, then press . 5. Rotate to select Channel List, then press . 6. Rotate to select a channel from a list, then press . 4. Select CH Channel Mode or CAT Category Mode. 5. Select a channel using the icons on the tune mode screen or the preset numbers (1-12) on the preset mode screen. In the channel mode, all available channels are selectable. In the category mode, you can select a channel within a category (Jazz, Rock, Classical, etc.). There may be instances when XM® Radio does not broadcast all the data fields (artist name, title). This does not indicate a problem with your audio system. 1. Tune to the selected station. 3. Rotate to select Save Preset, then press . 4. Rotate to select the preset number you want to store that station, then press . 4. Select the preset number you want to store that station. 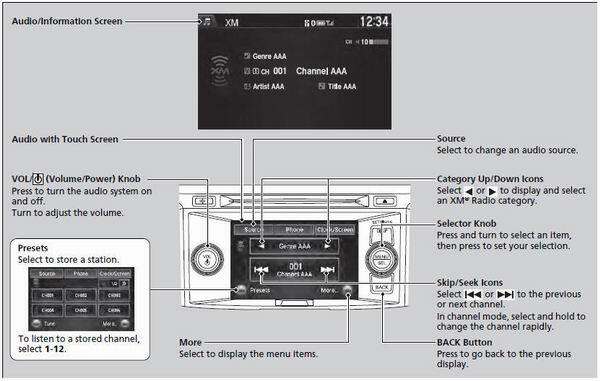 You can store 12 XM® stations into the preset memory.